A study into how animals secretly communicate has led to the discovery of a new way to create a polarizer — an optical device widely used in cameras, DVD players and sunglasses. In a quest to understand how these uncommon light signals are produced in mantis shrimp, researchers from the Ecology of Vision Group based in the University of Bristol’s School of Biological Sciences discovered that they use a polarizing structure unlike anything ever seen or developed by humans. The research is published in the journal Scientific Reports. Using a combination of careful anatomy, light measurements, and theoretical modeling, it was found that the mantis shrimp polarizers work by manipulating light across the structure rather than through its depth, which is how typical polarizers work. Such a photonic mechanism affords the animal with small, microscopically thin and dynamic optical structures that still produce big, bright and colorful polarized signals. Dr. Nicholas Roberts in the School of Biological Sciences said: “When it comes to developing a new way to make polarizers, nature has come up with optical solutions we haven’t yet thought of. Jordan, T, Wilby, D, Chiou, T-H, Feller, K, Caldwell, R, Cronin, T & Roberts, N, 2016, ‘A shape-anisotropic reflective polarizer in a stomatopod crustacean’. Scientific Reports. Many biophotonic structures have their spectral properties of reflection ‘tuned’ using the (zeroth-order) Bragg criteria for phase constructive interference. This is associated with a periodicity, or distribution of periodicities, parallel to the direction of illumination. The polarization properties of these reflections are, however, typically constrained by the dimensional symmetry and intrinsic dielectric properties of the biological materials. Here we report a linearly polarizing reflector in a stomatopod crustacean that consists of 6-8 layers of hollow, ovoid vesicles with principal axes of ~550nm, ~250nm and ~150nm. The reflection of unpolarized normally incident light is blue/green in colour with maximum reflectance wavelength of 520 nm and a degree of polarization greater than 0.6 over most of the visible spectrum. We demonstrate that the polarizing reflection can be explained by a resonant coupling with the first-order, in-plane, Bragg harmonics. These harmonics are associated with a distribution of periodicities perpendicular to the direction of illumination, and, due to the shape-anisotropy of the vesicles, are different for each linear polarization mode. This control and tuning of the polarization of the reflection using shape-anisotropic hollow scatterers is unlike any optical structure previously described and could provide a new design pathway for polarization-tunability in man-made photonic devices. There is a great diversity of reflective photonic structures throughout the animal kingdom, including biological analogues of periodic photonic crystals1,2,3,4, quasi-ordered amorphous solids5,6,7,8, and one-dimensional multilayer reflectors9,10,11,12. Biophotonic structures frequently serve as optical adaptations that enable animals to communicate through reflective visual signals. It is therefore highly advantageous to be able to control the optical properties of these reflectors and thus the visual information content of the reflection. For example, multilayer reflectors found in fish and cephalopods are ‘spectrally tuned’ via the distribution of layer thicknesses around the quarter-wave criteria to have colours that range from blue to silver9,12,13. However, whilst the principles that control and optimize either the reflected colour or the level of reflectivity are understood, the same cannot be said for how 3-dimensional animal photonic structures could be structured to control the polarization of light. At normal incidence, the polarization of the light reflected from the majority of photonic structures, whether biological or man-made, remains unchanged. In order to polarize the reflection, the symmetry of the photonic structure with respect to orthogonal polarization modes must be broken. For example, the circularly polarized reflections seen from the chitin structures in the elytra of beetles14 and cholesteric or chiral smectic liquid crystals15 arise due to chirality. In two-dimensional photonic crystals, it is a general result that for light propagation along correctly chosen coordinate axes it is possible to separate orthogonal polarization modes16,17 and geometric shape-anisotropy can be introduced to provide polarization-selective reflection and transmission17. In true 3-dimensional photonic crystals, however, it is in general not possible to obtain the strict separation of orthogonal polarization modes16. Subsequently, engineering a three-dimensional photonic structure to produce a reflection with a high degree of polarization mode separation is a non-trivial task. One 3-dimensional biophotonic structural reflector that potentially acts as a linear polarizer is found in the maxilliped appendages of certain species of stomatopod crustaceans (known commonly as mantis shrimps). Maxillipeds are frontal sets of modified limbs, generally used to manipulate food or for cleaning, and are involved in sexual and agonistic communication18,19,20. In the genus Haptosquilla, the first maxillipeds possess a striking and conspicuous blue/green colouration, which in some species is also strongly linearly polarized21,22.Figure 1a,b illustrates two species that display both blue/green and polarized reflections of the first maxillipeds, H. trispinosa (a) and H. banggai (b). The striking polarized blue/green structural colour of the first maxillipeds in species of the stomatopod genus Haptosquilla (a) Haptosquilla trispinosa. Scale bar approx. 15 mm. (b) H. banggai. Scale bar approx. 10 mm. J Exp Biol. 2012 Feb 15;215(Pt 4):584-9. http://dx.doi.org:/10.1242/jeb.066019. A novel function for a carotenoid: astaxanthin used as a polarizer for visual signalling in a mantis shrimp. Chiou TH1, Place AR, Caldwell RL, Marshall NJ, Cronin TW. Biological signals based on color patterns are well known, but some animals communicate by producing patterns of polarized light. Known biological polarizers are all based on physical interactions with light such as birefringence, differential reflection or scattering. We describe a novel biological polarizer in a marine crustacean based on linear dichroism of a carotenoid molecule. The red-colored, dichroic ketocarotenoid pigment astaxanthin is deposited in the antennal scale of a stomatopod crustacean, Odontodactylus scyllarus. Positive correlation between partial polarization and the presence of astaxanthin indicates that the antennal scale polarizes light with astaxanthin. Both the optical properties and the fine structure of the polarizationally active cuticle suggest that the dipole axes of the astaxanthin molecules are oriented nearly normal to the surface of the antennal scale. While dichroic retinoids are used as visual pigment chromophores to absorb and detect polarized light, this is the first demonstration of the use of a carotenoid to produce a polarizing signal. By using the intrinsic dichroism of the carotenoid molecule and orienting the molecule in tissue, nature has engineered a previously undescribed form of biological polarizer. Previous work21,22 hypothesised that the blue/green polarizing reflections arise from a quasi-ordered structure found under the cuticular surface of the maxillipeds. The three-dimensional architecture comprises a morphology of ovoid vesicles that exhibit degrees of both positional and orientational order21,22. In this paper, we use a combination of transmission electron microscopy, optical measurements, and theoretical modelling to validate that the reflection arises from this structure, which we categorise as a ‘shape-anisotropic amorphous solid’. Our theoretical model, which is based upon decomposing the optical response of the structure into contributions from different Bragg harmonics, demonstrates that the polarizing reflection can be explained by a resonant coupling between incident light and the in-plane (first-order) Bragg harmonics23,24. The first-order Bragg harmonics arise due to the in-plane periodicity from the spacing between the interior walls of the hollow ovoid vesicles, and, due to the in-plane shape-anisotropy, are different for each linear polarization mode. This in-plane coupling to a first-order Bragg harmonic has not been reported as a mechanism of reflection before in a biophotonic structure. To the best of our knowledge, the apparent ‘tunability’ of the polarization properties of reflection via the in-plane dimensions of the hollow vesicles provides a novel design pathway to control the polarization properties of reflection in a 3-dimensional photonic structure. Figure 2: Experimental setup to measure the polarized reflectivity of the first maxillipeds of Haptosquilla trispinosa. (a) Schematic diagram of the experimental setup used to measure the spectral reflections from the maxillipeds as a function of input and output polarization. (b) Optical micrograph of an individual H. trispinosa and the maxillipeds. Scale bar 10 mm. (c) Close up of the maxillipeds with an analyser placed horizontally (left) and vertically (right). Scale bar 1 mm. Eurasian Jay (Garrulus glandarius) feathers display periodic variations in the reflected colour from white through light blue, dark blue and black. We find the structures responsible for the colour are continuous in their size and spatially controlled by the degree of spinodal phase separation in the corresponding region of the feather barb. Blue structures have a well-defined broadband ultra-violet (UV) to blue wavelength distribution; the corresponding nanostructure has characteristic spinodal morphology with a lengthscale of order 150 nm. White regions have a larger 200 nm nanostructure, consistent with a spinodal process that has coarsened further, yielding broader wavelength white reflectance. Our analysis shows that nanostructure in single bird feather barbs can be varied continuously by controlling the time the keratin network is allowed to phase separate before mobility in the system is arrested. Dynamic scaling analysis of the single barb scattering data implies that the phase separation arrest mechanism is rapid and also distinct from the spinodal phase separation mechanism i.e. it is not gelation or intermolecular re-association. Any growing lengthscale using this spinodal phase separation approach must first traverse the UV and blue wavelength regions, growing the structure by coarsening, resulting in a broad distribution of domain sizes. The vibrancy and variety of structural colours found in nature has long been well-known; what has only recently been discovered is the sophistication of the physics that underlies these effects1,2,3,4,5. Bird feathers have proved particularly important in our understanding of structural colour. Structurally coloured feathers are a stable nanostructured material made from β-keratin that can be studied in detail even after collection, although pigmented sections or layers will degrade over time, importantly any nanostructure will remain. Iridescent feathers such as the tail feather of the male Peacock are a vibrant example of the wealth of possible colours. Robert Hooke, a founding father of optical microscopy was one of the first to examine the Peacock6,7 and Duck8 feathers in his revolutionary text Micrographia. He saw that by exposing them to water he could alter the intensity of the colour9. Clyde Mason performed a comprehensive study of this effect for the case of the Blue Jay (Cyanocitta Cristata). He was able to optically contrast match the permeating solvent to that of the blue feather barbs using Canada balsam (n 1.54)10. Solvents above and below the refractive index of β-keratin (n 1.54)11 showed distinct colour, pale blue in the case of the solvent Carbon disulphide (n 1.627) and a sea green colour for water (n1.33). The conclusion of this repeated solvent exposure is that the blue colour is not due to a pigment, as this would not explain this switching off and on of the colour. In this paper we primarily focus on a comprehensive study of the Eurasian Jay and the origins of its structural colour. We also detail spatially modulated structures in a number of geographically diverse birds spanning the globe, from the two dominant types of isotropic structural colours found in nature. These structure formation routes are categorized as sphere forming (nucleation and growth) and channel type (spinodal decomposition). Initially we examine the Eurasian Jay, shown in Fig. 1b, with its distinctive flash coloration on the wing feathers. This pattern is the same for both male and female. It is periodic on the macroscopic scale (Fig. 1a) and along an individual feather barb (see Fig. 6a). The purpose of these markings is still unclear but possible explanations include species recognition at a distance or as a sexual selection signal12 where the ultra violet component of the signal could also play a role13. When the feather is seen in cross section (Fig. 1c) it is evident that only a thin layer (~10 μm) is needed to provide the effect. The microstructure of individual barbs shows a network of polygonal cells (Fig. 1d,e), responsible for the structural colour, having an appearance of a thick layer of blue enamel, termed “émail” by Fatio14,15,16. Figure 1: Optical images of a Eurasian Jay (Garrulus glandarius) feather at different lengthscales. (a) The periodically patterned Jay feather covert, with a period of around 4.5 mm. (b) Photograph of the Jay Garrulus glandarius (Credit: Luc Viatour/www.Lucnix.be) this image is licensed under the Attribution-ShareAlike 3.0 Unported license. The license terms can be found on the following link:https://creativecommons.org/licenses/by-sa/3.0/” (c) A transverse cross section of the light blue part of a Jay feather barb, showing the dorsal portion of the barb with a thin protective outer sheath on top of the vividly blue region, which resembles an arc of colour. d and e, optical microscopy images of the light blue region, the boundaries of these cells are ordinarily invisible under reflected light. In e using a polarizer and an analyser in the optical path, it is possible to distinguish the polygonal cells boundaries, which look distinctly like Voronoi tessellation structures. These range in size from 10 μm–20 μm in diameter and similarly in depth. The blue colour in the barbs is located in the polygonal cells22 due to a porous network with dimensions smaller than the wavelength of light23. (b) The measured reflectance for the different regions of a Jay feather covert. Photoreceptor cells transform information entering the eye as photons into patterns of neuronal electrical activity. This transformation takes place in the sensory cilium organelle, the outer segment. Outer segments are built from a relatively small set of structural and signaling proteins, including components of the classical GPCR phototransduction cascade. Such a distinct functional and morphological specialization allow outer segments to serve as a nearly unmatched model system for studying general principles of GPCR signaling (Arshavsky et al., 2002) and, in more recent years, a model for ciliary trafficking (Garcia-Gonzalo and Reiter, 2012; Nemet et al., 2015; Pearring et al., 2013; Schou et al., 2015; Wang and Deretic, 2014). Despite our deep understanding of visual signal transduction, little is known how the outer segment is populated by proteins performing this function. Indeed, nearly all mechanistic studies of outer segment protein trafficking were devoted to rhodopsin (Nemet et al., 2015; Wang and Deretic, 2014), which is a GPCR visual pigment comprising the majority of the outer segment membrane protein mass (Palczewski, 2006). The mechanisms responsible for outer segment delivery of other transmembrane proteins remain essentially unknown. Some of them contain short outer segment targeting signals, which can be identified through site-specific mutagenesis (Deretic et al., 1998; Li et al., 1996; Pearring et al., 2014; Salinas et al., 2013; Sung et al., 1994; Tam et al., 2000; Tam et al., 2004). A documented exception is retinal guanylate cyclase 1 (GC-1), whose exhaustive mutagenesis did not yield a distinct outer segment targeting motif (Karan et al., 2011). GC-1 is a critical component of the phototransduction machinery responsible for synthesizing the second messenger, cGMP (Wen et al., 2014). GC-1 is the only guanylate cyclase isoform expressed in the outer segments of cones and the predominant isoform in rods (Baehr et al., 2007; Yang et al., 1999). GC-1 knockout in mice is characterized by severe degeneration of cones and abnormal light-response recovery kinetics in rods (Yang et al., 1999). Furthermore, a very large number of GC-1 mutations found in human patients cause one of the most severe forms of early onset retinal dystrophy, called Leber’s congenital amaurosis (Boye, 2014; Kitiratschky et al., 2008). Many of these mutations are located outside the catalytic site of GC-1, which raises great interest to understanding the mechanisms of its intracellular processing and trafficking. In this study, we demonstrate that, rather than relying on its own targeting motif, GC-1 is transported to the outer segment in a complex with rhodopsin. We conducted a comprehensive screen of outer segment protein localization in rod photoreceptors of rhodopsin knockout (Rho-/- ) mice and found that GC-1 was the only protein severely affected by this knockout. We next showed that this unique property of GC-1 is explained by its interaction with rhodopsin, which likely initiates in the biosynthetic membranes and supports both intracellular stability and outer segment delivery of this enzyme. These findings explain how GC-1 reaches its specific intracellular destination and also expand the role of rhodopsin in supporting normal vision by showing that it guides trafficking of another key phototransduction protein. Our data consolidate a number of previously published observations, including a major puzzle related to GC-1: the lack of a distinct ciliary targeting motif encoded in its sequence. The shortest recombinant fragment of GC-1 which localized specifically to the outer segment was found to be very large and contain both transmembrane and cytoplasmic domains (Karan et al., 2011). Our study shows that GC-1 delivery requires rhodopsin and, therefore, can rely on specific targeting information encoded in the rhodopsin molecule. Interestingly, we also found that this information can be replaced by an alternative ciliary targeting sequence from a GPCR not endogenous to photoreceptors. This suggests that the functions of binding/stabilization of GC-1 and ciliary targeting are performed by different parts of the rhodopsin molecule. Our findings also shed new light on the report that both rhodopsin and GC-1 utilize intraflagellar transport (IFT) for their ciliary trafficking and co-precipitate with IFT proteins (Bhowmick et al., 2009). The authors hypothesized that GC-1 plays a primary role in assembling cargo for the IFT particle bound for ciliary delivery. Our data suggest that it is rhodopsin that drives this complex, at least in photoreceptor cells where these proteins are specifically expressed. Unlike GC-1’s reliance on rhodopsin for its intracellular stability or outer segment trafficking, rhodopsin does not require GC-1 as its expression level and localization remain normal in rods of GC-1 knockout mice ((Baehr et al., 2007) and this study). The outer segment trafficking of cone opsins is not affected by the lack of GC-1 either (Baehr et al., 2007; Karan et al., 2008), although GC-1 knockout cones undergo rapid degeneration, likely because they do not express GC-2 – an enzyme with redundant function. The primary role of rhodopsin in guiding GC-1 to the outer segment is further consistent with rhodopsin directly interacting with IFT20, a mobile component of the IFT complex responsible for recruiting IFT cargo at the Golgi network (Crouse et al., 2014; Keady et al., 2011). Finally, GC-1 trafficking was reported to depend on the small protein, RD3, thought to stabilize both guanylate cyclase isoforms, GC-1 and GC-2, in biosynthetic membranes (Azadi et al., 2010; Zulliger et al., 2015). In the case of GC-1, this stabilization would be complementary to that by rhodopsin and potentially could take place at different stages of GC-1 maturation and trafficking in photoreceptors. Another proposed function of RD3 is to inhibit the activity of guanylate cyclase isoforms outside the outer segment in order to prevent undesirable cGMP synthesis in other cellular compartments (Peshenko et al., 2011a). The ability of the adult brain to undergo plastic changes is of particular interest in medicine, especially regarding recovery from injuries or improving learning and cognition. 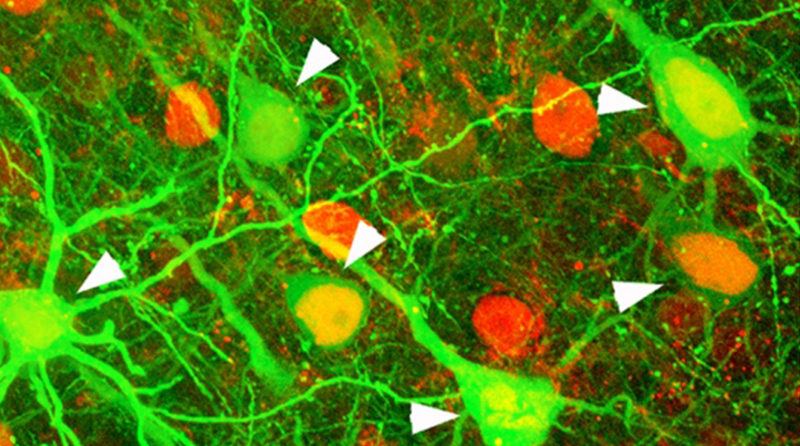 Matrix metalloproteinases (MMPs) have been associated with juvenile experience-dependent primary visual cortex (V1) plasticity, yet little is known about their role in this process in the adult V1. Activation of MMPs is a crucial step facilitating structural changes in a healthy brain; however, upon brain injury, upregulated MMPs promote the spread of a lesion and impair recovery. To clarify these seemingly opposing outcomes of MMPs-activation, we examined the effects of MMPs-inhibition on experience-induced plasticity in healthy and stoke-affected adult mice. In healthy animals, 7-day application of MMPs-inhibitor prevented visual plasticity. Additionally, treatment with MMPs-inhibitor once but not twice following stroke rescued plasticity, normally lost under these conditions. Our data imply that a fine balance of MMPs-activity is crucial for adult visual plasticity to occur. Neuroplasticity is the ability of the brain to adapt both structurally and functionally to changing patterns of activity induced by the environment or intrinsic factors. In the clinical setting, plasticity is important for tissue repair and neural network rewiring, necessary for recovery and optimal post-injury brain function. The primary visual cortex (V1) is a widely used model region for studying sensory plasticity in young vs. adult brains (Hofer et al., 2006; Espinosa and Stryker, 2012; Levelt and Hübener, 2012). In mammals, V1 consists of a monocular and a binocular zone; neurons in the binocular zone respond to stimulation of both eyes but are dominated by the contralateral eye in rodents (Dräger, 1975, 1978). This ocular dominance (OD) can be modified in an experience-dependent manner, by depriving one eye of pattern vision for several days (known as monocular deprivation or MD), as originally observed by Wiesel and Hubel more than 50 years ago (Wiesel and Hubel, 1965). OD-plasticity has become one of the major paradigms for studying cortical plasticity. In standard-cage raised mice, OD-plasticity in binocular V1 is most pronounced in 4- 30 week-old animals; reduced, yet present, in early adulthood; and absent in animals 31 older than 110 days of age (Lehmann and Löwel, 2008). In 4-week-old mice, 3-4 days of MD are sufficient to induce a significant OD-shift towards the open eye (juvenile OD-plasticity), while 7 days of MD are needed in 3-month-old animals (adult 34 OD-plasticity) (Gordon and Stryker, 1996; Sawtell et al., 2003; Frenkel and Bear, 2004; Mrsic-Flogel et al., 2007; Sato and Stryker, 2008). Although the experimental paradigm is rather similar, molecular mechanisms underlying “juvenile” and “adult” OD-plasticity are different: in juvenile mice, OD-shifts are mostly mediated by 38 reductions in deprived eye responses while adult plasticity is predominantly mediated by an increase in open eye responses in V1 (Hofer et al., 2006; Espinosa and Stryker, 2012; Levelt and Hübener, 2012). Activity driven modifications in neuronal circuits can be facilitated by degradation of the extracellular matrix (ECM) (Pizzorusso et al., 2002; de Vivo et al., 2013), which 4 provides structural and biochemical support for the cells (Frischknecht and Gundelfinger, 2012). Structural and molecular composition of the ECM changes during development, becoming denser and more rigid in the mature brain (Frischknecht and Gundelfinger, 2012; de Vivo et al., 2013). This structural composition is partially regulated by a family of zinc dependent endopeptidases, the matrix metalloproteinases (MMPs), and their enzymatic activity is crucial for proper development, function and maintenance of neuronal networks (Milward et al., 2007; Huntley, 2012). A recent study in juvenile rats showed that pharmacological inhibition of MMPs with a broad spectrum inhibitor during the MD-period did not influence the reduction of the closed-eye responses induced by 3 days of MD, yet it prevented the potentiation of the nondeprived eye responses in V1 after 7 days of MD (Spolidoro et al., 2012). Whether MMPs are involved in adult OD-plasticity, for which mechanisms are believed to be different (Hofer et al., 2006; Sato and Stryker, 2008; Ranson et al., 2012), is not yet known, and clarifying this point was the first goal of this study. In addition to MMPs involvement in healthy brain function, their excessive activity can also be detrimental (Agrawal et al., 2008; Huntley, 2012). Both human and animal studies found upregulated activity of MMPs following inflammation, infectious diseases or brain trauma (Agrawal et al., 2008; Rosell and Lo, 2008; Morancho et al., 2010; Vandenbroucke and Libert, 2014), and pharmacological inhibition of MMPs shortly after brain injuries reduced infarct sizes and prompted better recovery (Romanic et al., 1998; Lo et al., 2002; Gu et al., 2005; Wang and Tsirka, 2005; Yong, 2005; Morancho et al., 2010; Chang et al., 2014; Vandenbroucke and Libert, 2014). Stroke can influence synaptic activities within the area directly affected by it, and also in a broader area surrounding the lesion (Witte et al., 2000; Murphy and Corbett, 2009). Likewise, impairments in experience-dependent plasticity after a cortical stroke also have been observed in distant brain regions (Jablonka et al., 2007; Greifzu et al., 2011): in 3-month-old mice, a focal stroke in the primary somatosensory cortex (S1) prevented both V1-plasticity and improvements of the 5 spatial frequency and contrast thresholds of the optomotor reflex of the open eye (Greifzu et al., 2011). Interestingly, some MMPs were shown to be upregulated within the first 24 hours after focal stroke (Cybulska-Klosowicz et al., 2011; Liguz-Lecznar et al., 2012). Thus, the second goal of our study was to test whether balancing the upregulated MMPs resulting from a focal stroke in S1 would rescue visual plasticity. Using a combination of in vivo optical imaging of intrinsic signals and behavioral vision tests in adult mice, we observed that application of the broad spectrum MMPs-inhibitor GM6001 during the 7-day MD-period prevented both OD-plasticity and enhancements of the optomotor response of the open eye. In addition, a single treatment after the S1-stroke rescued plasticity in both paradigms, whereas treatment with the inhibitor two times diminished plasticity-promoting effect. Together, these data reveal a crucial role of MMPs in adult visual plasticity and suggest that MMPs-activity has to be within a narrow window for experience-induced plasticity to occur. The objective of this study was to examine if MMPs are crucial for adult visual plasticity, and if inhibition of their upregulation following cortical stroke may be beneficial for rescuing lost plasticity. A combination of in vivo optical imaging and behavioral vision tests revealed that balanced MMPs activity is essential for adult visual plasticity to occur in the healthy and stroke-affected brain. In healthy adult mice, MMPs-inhibition with GM6001 prevented both ocular dominance plasticity and experience-driven improvements of the optomotor reflex of the open eye after MD, indicating that MMPs activation is required for normal adult plasticity. In addition, blockade of elevated MMPs-activity after a cortical stroke rescued compromised plasticity. Specifically, a single but not two-times treatment with GM6001 after a cortical PT-lesion in the neighboring S1 region fully rescued experience-dependent ocular dominance plasticity in adult V1, which is normally lost under these conditions. These observations suggest that MMPs-activity has to be within a narrow window to allow visual plasticity: if MMPs-activity is downregulated (with inhibitors) or upregulated (after stroke) experience-induced plastic changes are compromised. In a healthy brain, the enzymatic activity of MMPs has plasticity promoting effects (Milward et al., 2007; Huntley, 2012). Consequently to increased neuronal activity, activated MMPs can lessen physical barriers (loosen up the ECM) or via the degradation of certain receptors influence signaling pathways. Such changes within neuronal cells and their synapses thereby alter the structure and activity of neuronal networks (Milward et al., 2007; Huntley, 2012). Involvement of MMPs in synaptic circuit remodeling has been mainly studied in the hippocampus, yet their abundant expression in the central nervous system (CNS) indicates a much broader function. For instance, MMP9-deficient mice showed modestly reduced experience-dependent plasticity in the barrel cortex (Kaliszewska et al., 2012) and MMP3-deficient mice displayed abnormal neuronal morphology in the visual cortex and impaired plasticity induced by long-term monocular enucleation (Aerts et al., 2014). Here, we used a different approach to probe the role of MMPs in experience-induced changes in the visual system: we performed the experiments in wild type mice and treated them with the broad-spectrum inhibitor GM6001 or vehicle during 7 days of MD. Consistent with previous findings (Gordon and Stryker, 1996; Sawtell et al., 2003; Sato and Stryker, 2008), the OD-shift of vehicle-treated mice was mediated by open-eye potentiation. In contrast, there was no change in the open nor in the closed eye responses and hence no OD-plasticity in V1 after MD in GM6001-treated adult mice. This is in line with recent observations from juvenile rats, in which chronic treatment with GM6001 also prevented open eye potentiation after 7 days of MD (Spolidoro et al., 2012). However, treatment in this study only partially prevented the OD-shift, as there was no effect on the reduction of deprived eye responses (Spolidoro et al., 2012). A reduction in deprived eye responses in V1 is mostly observed in juvenile rodents after 3-4 days of MD (Gordon and Stryker, 1996), unless different raising conditions are used such as enriched environment or running wheel (Greifzu et al., 2014; 323 Kalogeraki et al., 2014). In adult, standard-cage raised mice, 6-7 days of MD are necessary for significant OD-shifts and changes are mainly mediated by increases of open eye responses in V1 (Gordon and Stryker, 1996; Sawtell et al., 2003; Sato and 326 Stryker, 2008). MMP9 activity was suggested in the potentiation of the open eye responses in juvenile rats, as treatment with GM6001 significantly reduced MMP9-mRNA expression only in the hemisphere where structural changes took place (Spolidoro et al., 2012). Since we observed a full blockade of plasticity after GM6001- treatment, it would be of interest to determine whether MMP9 is crucial for open-eye potentiation also in the adult brain. MMP9 has been widely investigated in various plasticity paradigms (Milward et al., 2007; Frischknecht and Gundelfinger, 2012; Huntley, 2012; Tsilibary et al., 2014) and one of the molecules shown to stimulate MMP9 secretion and expression in vitro and in vivo is tumor necrosis factor alpha (TNFalpha) (Hanemaaijer et al., 1993; Candelario-Jalil et al., 2007). TNFalpha signaling was found to play an important role in the open eye potentiation in juvenile (Kaneko et al., 2008), but not in adult V1 plasticity (Ranson et al., 2012), and since our data reveal that MMPs are indispensable for adult V1 plasticity, MMPs-activation in the adult brain is most likely not dependent on TNF alpha signaling. Accordingly, this adds to the notion that juvenile and adult V1 plasticity depend on different molecular mechanisms (Hofer et al., 2006; Sato and Stryker, 2008; Ranson et al., 342 2012). Together, our new data demonstrate a vital role of MMPs for adult visual cortex plasticity, in particular for the increase of open eye responses in V1 after MD, and notably expand the previous studies from juvenile rats. Under normal conditions, MMPs-activity supports healthy brain development and function; yet a different outcome of MMPs action has been described for diseased brain (Agrawal et al., 2008). Under pathophysiological conditions like inflammation, infection or stroke, uncontrolled MMPs driven proteolysis can lead to negative consequences (Rosenberg et al., 1996; Rosenberg, 2002; Agrawal et al., 2008). Excessive MMPs-activity after stroke caused blood brain barrier disruption, upregulation of inflammatory mediators, excitotoxicity and eventually cell death; (Romanic et al., 1998; Lo et al., 2002; Gu et al., 2005; Wang and Tsirka, 2005; Yong, 354 2005; Morancho et al., 2010; Chang et al., 2014; Vandenbroucke and Libert, 2014). Recent studies reported increased enzymatic MMP9 activity within 24 hours after a PT-stroke, and application of a broad spectrum MMPs-inhibitor (FN-439) applied at the time of stroke induction, partially rescued impaired barrel cortex plasticity (Cybulska-Klosowicz et al., 2011; Liguz-Lecznar et al., 2012). Here we tested whether inhibition of upregulated MMPs-activity (resulting from PT-stroke) may rescue cortical plasticity also when the treatment starts after lesion induction. Indeed, a single GM6001-treatment after PT in the neighboring S1 fully rescued plasticity in both of our experimental paradigms, OD- and interocular plasticity. Importantly, successful treatment did not have to start immediately after stroke induction (1h) because treatment 24h after stroke had the same beneficial effect, highlighting the therapeutic potential of brief MMPs-inhibition for stroke recovery. Beneficial treatment was, however, dependent on the number of injections: a single but not two-times injection of the MMPs-inhibitor rescued OD-plasticity. The reduced plasticity- promoting effect in V1 of mice treated twice with GM6001 is likely due to too excessive MMPs-downregulation, which in turn interfered with MMPs facilitation of MD-induced plasticity. Consistent with this interpretation, it was reported that a particular dosage, timing as well as duration of MMPs-inhibition mattered for reduciton of lesion sizes after intracerebral hemorrhage, blood brain barrier permability or neurovascular remodeling in post-stroke period (Wang and Tsirka, 2005; Zhao et al., 2006; Sood et al., 2008; Chang et al., 2014). Together with the results from healthy animals, our data suggest that the plasticity-promoting effects of MMPs are dependent on a well-balanced level of activation, and if that balance is disturbed, experience-induced plastic changes are compromised. There are several plausible mechanisms by which MMPs inhibition rescues OD- plasticity after stroke in S1. Stroke influences brain function in numerous ways e.g., causing inflammation and apoptosis, or disrupting the tightly regulated balance of neuronal inhibition and excitation (Neumann-Haefelin et al., 1995; Schiene et al., 1996; Witte and Stoll, 1997; Que et al., 1999a; Que et al., 1999b; Witte et al., 2000) also in perilesional areas (Murphy and Corbett, 2009). One of the major consequences of ischemic damage is an elevated level of the neurotransmitter glutamate, leading to excitotoxicity and neuronal death (Lai et al., 2014). On the other hand, stroke can lead to increased tonic inhibition in the peri-infarct zone, and reducing this inhibition can promote functional recovery (Clarkson et al., 2010). In addition, focal ischemia can induce spreading depression within ipsilateral cortex (Schroeter et al., 1995) and a recent study showed that this phenomenon 391 upregulated MMPs, leading to a breakdown of the blood brain barrier, edema, and vascular leakage, which was suppressed by GM6001 treatment (Gursoy-Ozdemir et al., 2004). Thus, it is likely that treatment with GM6001 shortly after the stroke – as in the present study – downregulated MMPs, thus reduced spreading depression, improved disturbed excitation/inhibition balance and allowed plastic changes to 396 occur. Although we observed clear functional rescue of OD-plasticity after GM6001- treatment, there was no apparent effect on the lesion size: the PT-lesions in GM6001-treated mice were not smaller compared to vehicle-injected mice. This is in line with a recent observation, that a different broad-spectrum MMPs-inhibitor (FN- 143) did not attenuate brain damage resulting from photothrombosis, but partially rescued barrel cortex plasticity (Cybulska-Klosowicz et al., 2011). The present results, together with the above mentioned study, are not easy to reconcile with findings where MMPs-inhibitors reduced the volume of a brain injury (Gu et al., 2005; Wang and Tsirka, 2005; Vandenbroucke and Libert, 2014). The difference might arise from the method used for stroke induction, dosage of inhibitors, timing and duration of the treatment and severity of the lesion. Behavioral vision tests additionally revealed an involvement of MMPs for interocular 410 plasticity during MD. The optomotor reflex is known to be mediated by subcortical pathways (Giolli et al., 2005). While visual capabilities measured by optomotry mainly reflect the properties of the retinal ganglion cells that project to these subcortical structures (Douglas et al., 2005), daily testing in the optomotor setup after MD induces a cortex-dependent and experience-enabled enhancement of spatial vision through the open eye (Prusky et al., 2006). Although inflammation was shown to interfere with the experience-enabled optomotor changes (Greifzu et al., 2011), little is known about the cellular origins or signaling pathways responsible for this plasticity paradigm. Here, we found that daily application of the MMPs-inhibitor during MD prevented enhancements in both the spatial frequency and contrast sensitivity thresholds of the optomotor reflex of the open eye, while vehicle-treated control mice displayed the typical experience-enabled optomotor improvements. On the other hand, treatment of mice with the same inhibitor once or twice following cortical stroke rescued the impaired optomotor improvements. Thus, in contrast to the OD-plasticity results, rescue of optomotor improvements was present regardless of the duration of the treatment, adding to the idea that separate mechanisms and different neuronal circuits are responsible for OD- and interocular plasticity (Greifzu et al., 2011; Kang et al., 2013; Greifzu et al., 2014). Together our results establish a novel function of MMPs in experience-enabled enhancements of the optomotor reflex of the open eye after MD in adult mice. In conclusion, our present data highlight a critical role of MMPs in adult visual plasticity. They further suggest that upregulation of MMPs-activity shortly after a cortical lesion compromises experience-induced visual plasticity, which in turn can be rescued by brief MMPs-inhibition. Precise regulation of MMPs-activity therefore seems to be essential for facilitating plasticity in the adult brain and offers new opportunities in treatment and recovery for stroke. It remains to be determined which particular MMPs account for the present results.